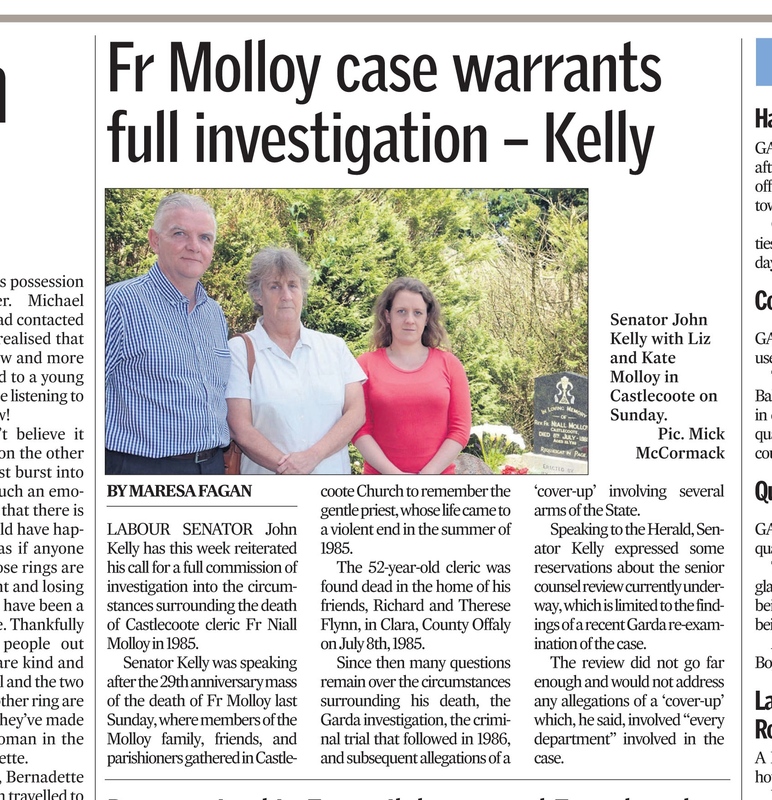 “FG and Labour vow to reopen probe into killing of priest”. 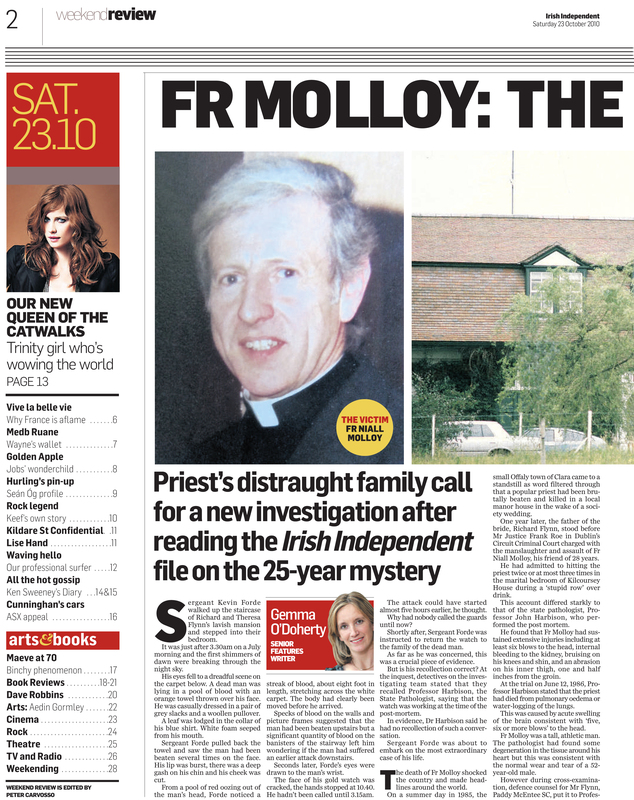 Irish Independent. 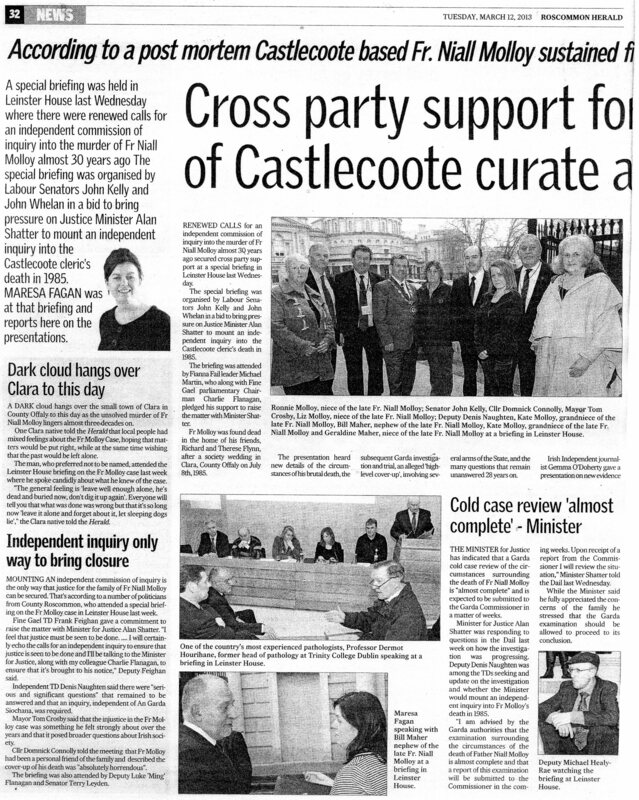 (17 November 2010). 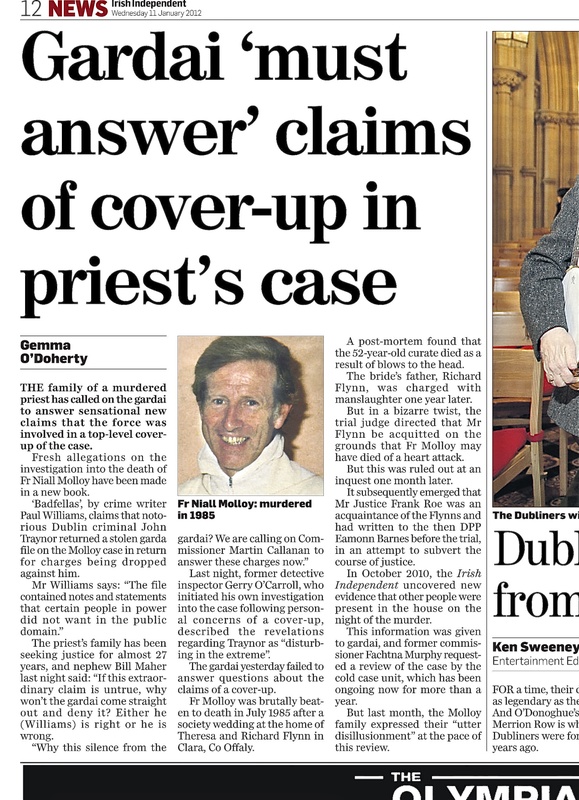 “Priest was left to die for six hours, new evidence claims”. 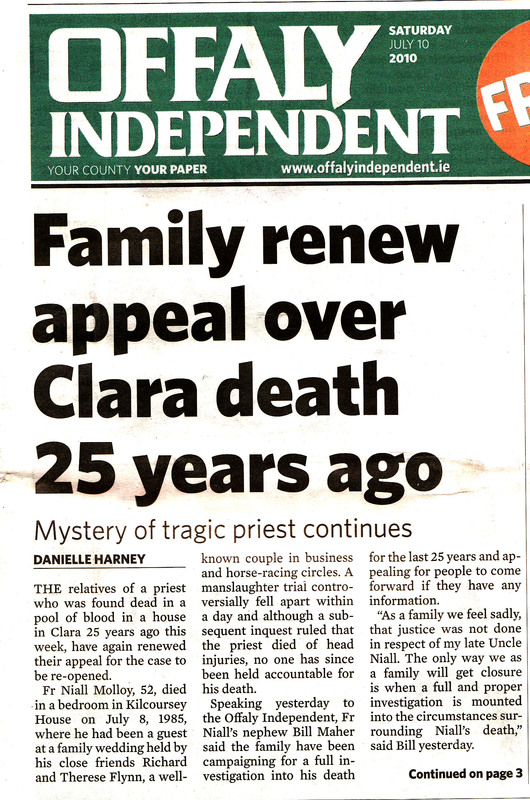 Irish Independent. 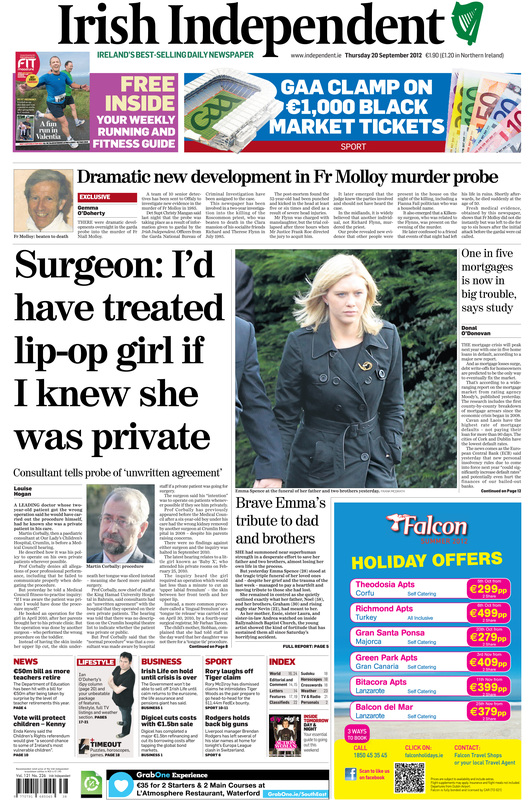 (12 August 2011). 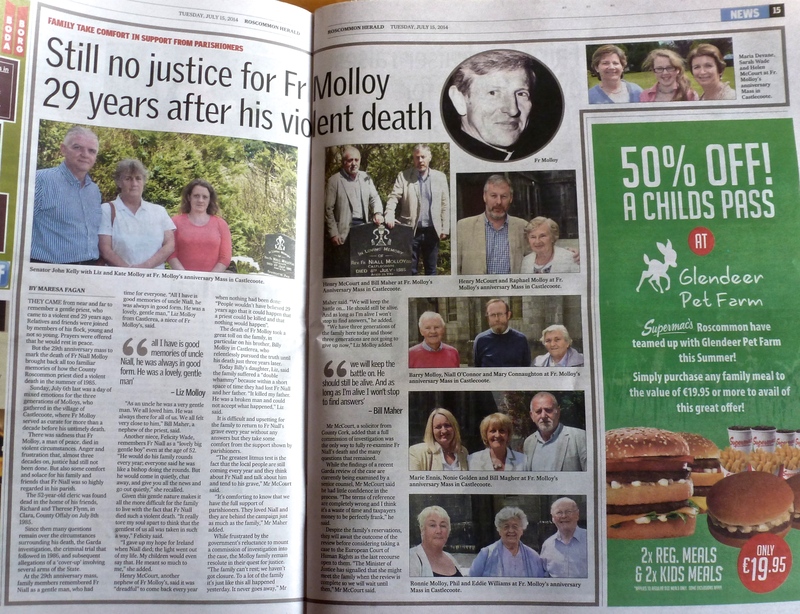 “Fr Niall: why we’ll never stop our fight for justice”. 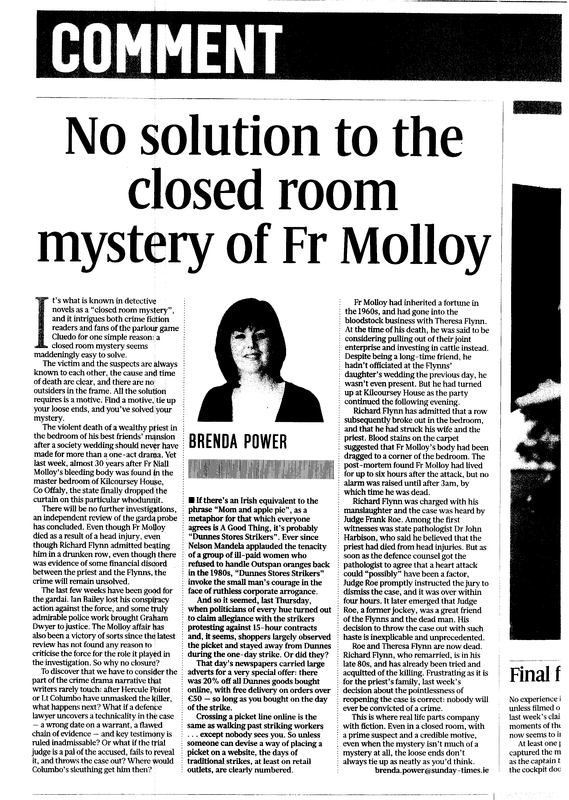 Irish Independent. 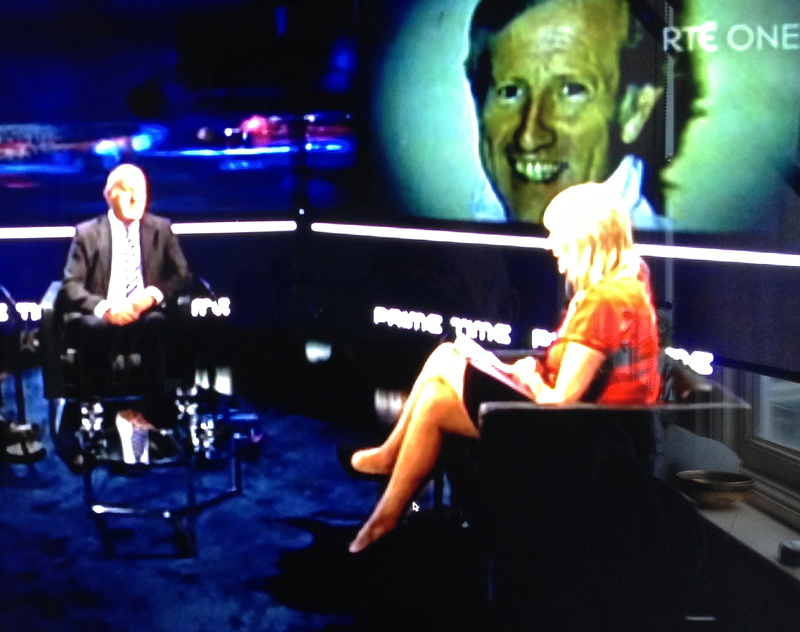 22 September 2012. 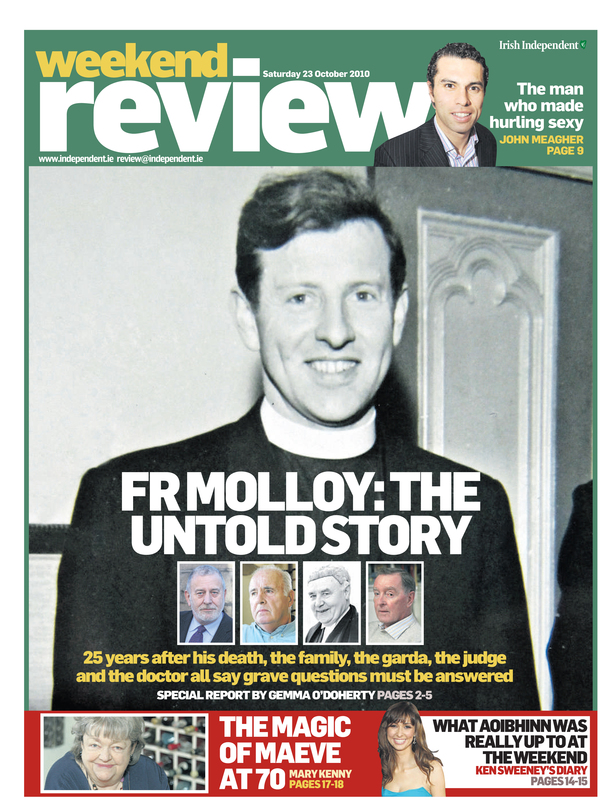 “The death of Fr. 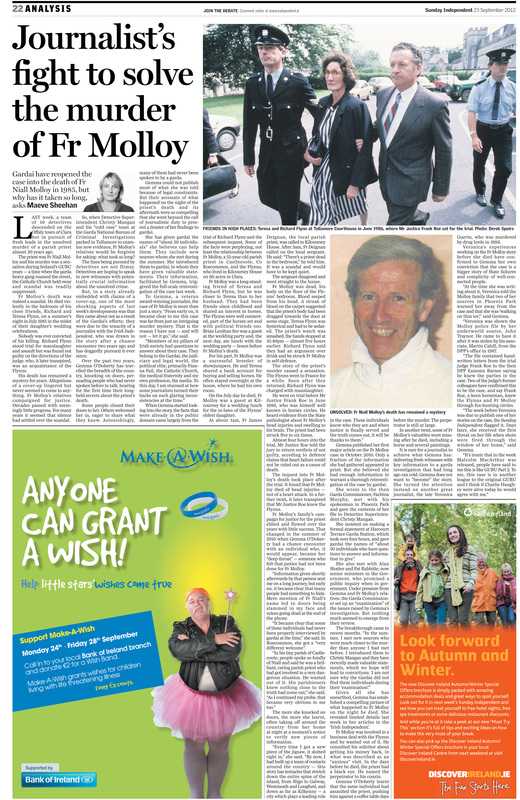 Niall Molloy ” , ( 19 january 2013 ) http://www.independent.ie/lifestyle/the-death-of-fr-niall-molloy-28960717. 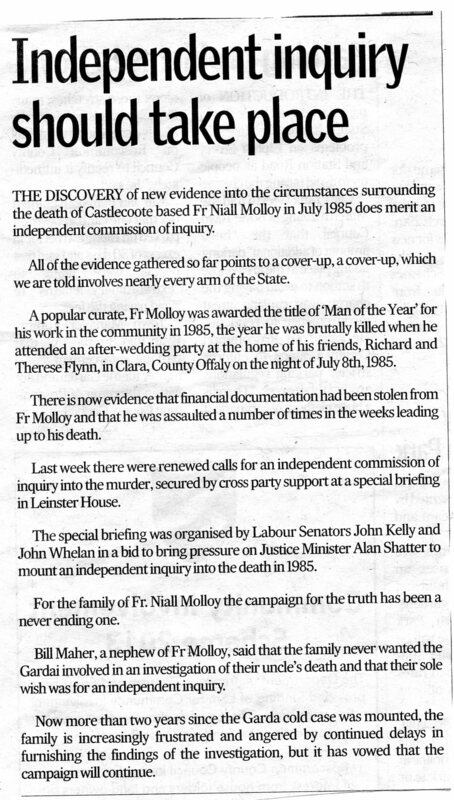 “New evidence” -extract from article. 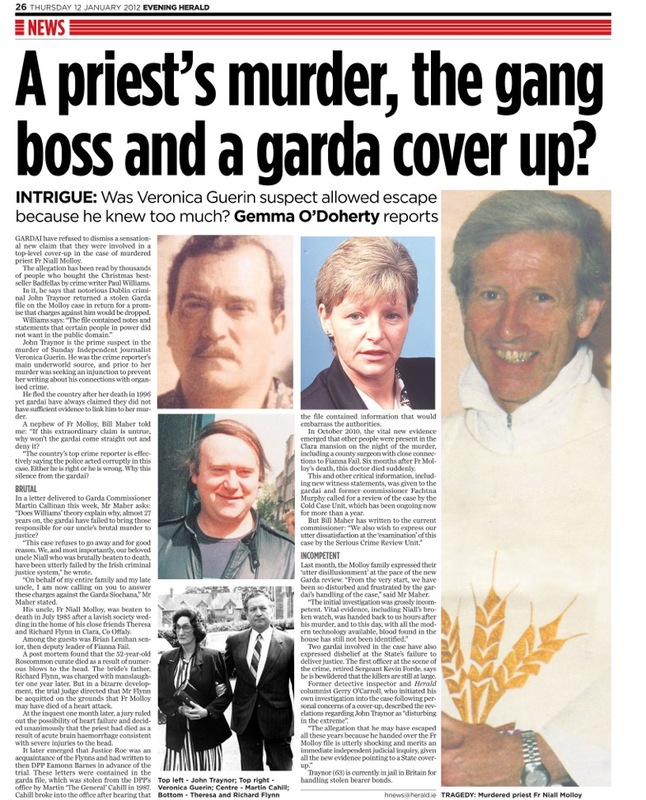 Commissioner now has Garda report. 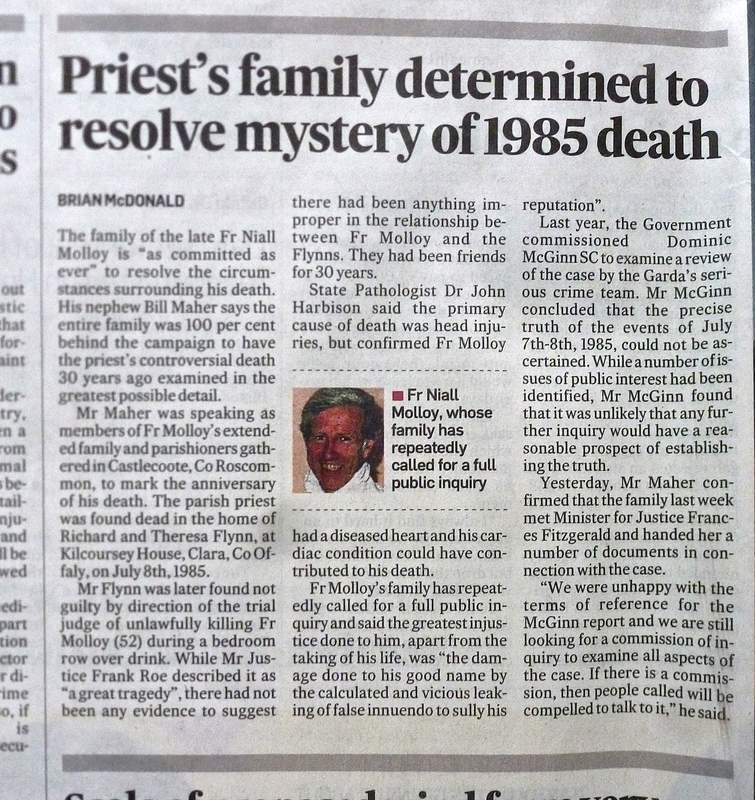 THE nephew of Fr Niall Molloy the priest who was murdered in Clara in 1985 has welcomed reports that the Garda Serious Crime Review team has recommended a public inquiry into his death. 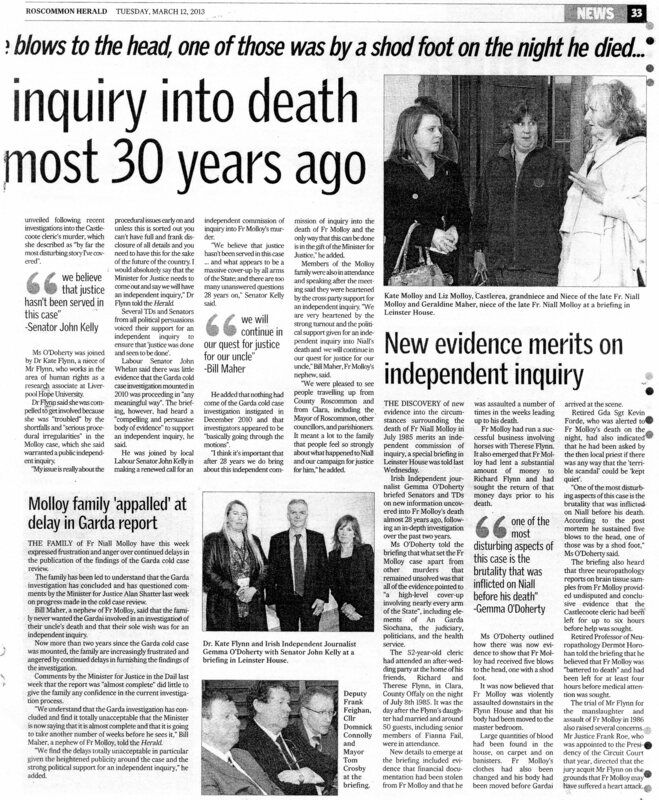 A review of their investigations has been handed over to the Garda Commissioner Martin Callinan who will present it to Minister Alan Shatter. 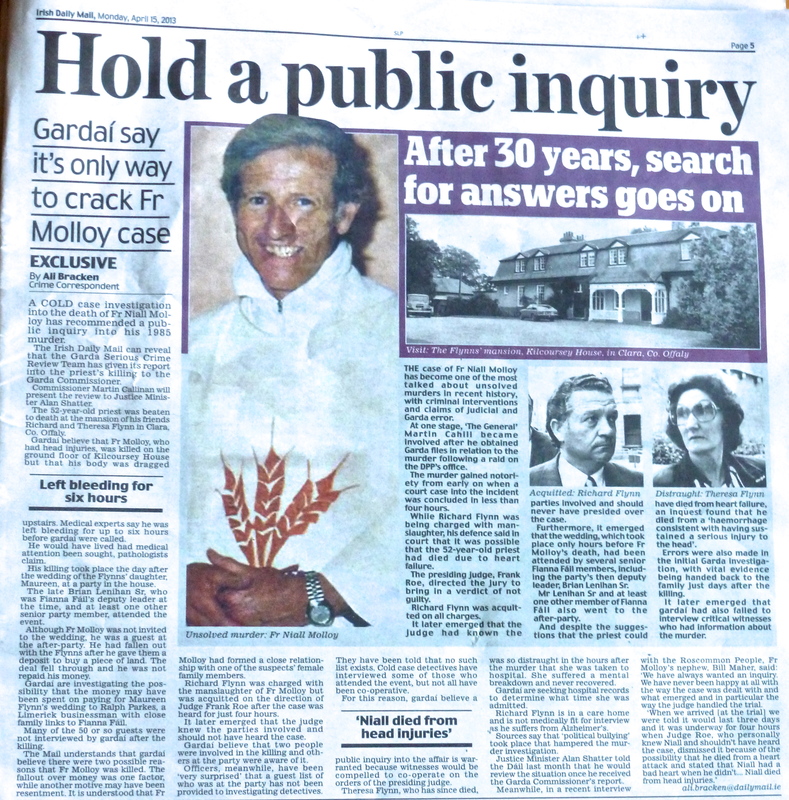 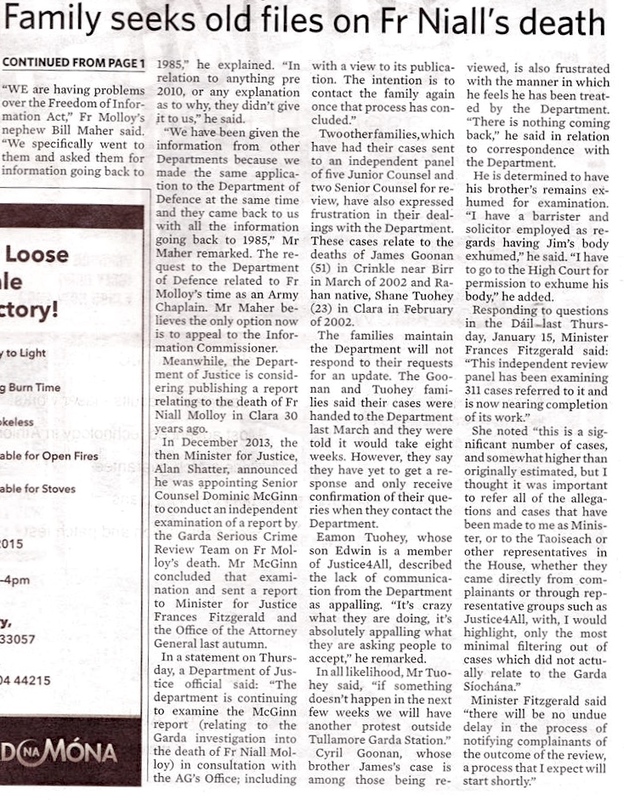 ‘I am absolutely delighted that the gardai are backing up our call for an independent inquiry. 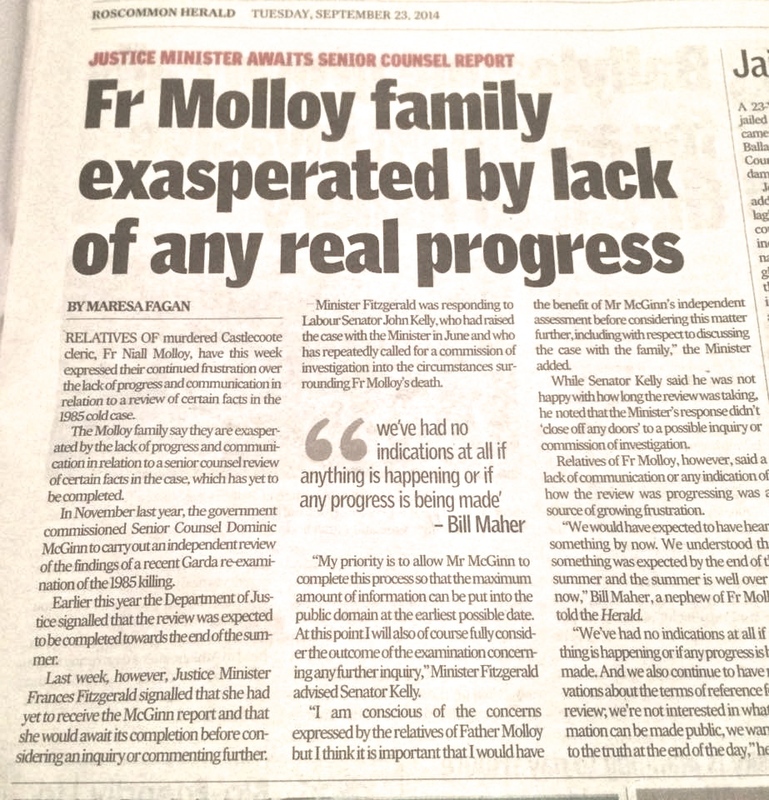 This is what we wanted all along,’ said Mr Bill Maher who believes that if a new investigation goes ahead and is ‘done properly’ it will reveal new evidence. 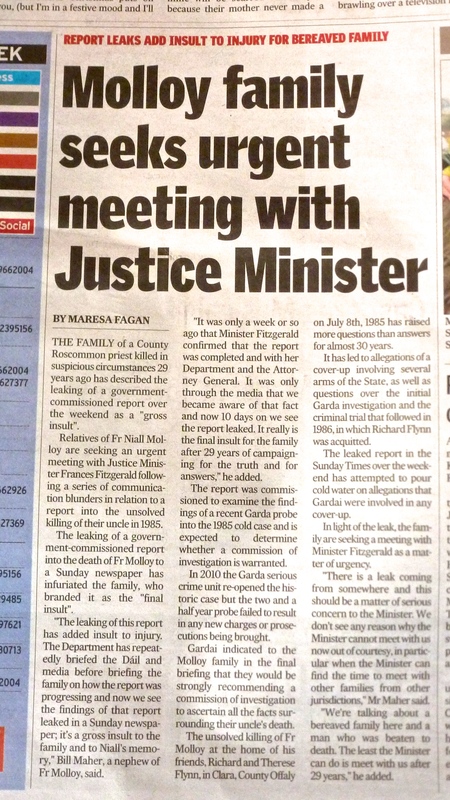 ‘I believe justice will be done, this is quite strong the gardai are our national police force and there is obviously something they are not happy with’, he added. 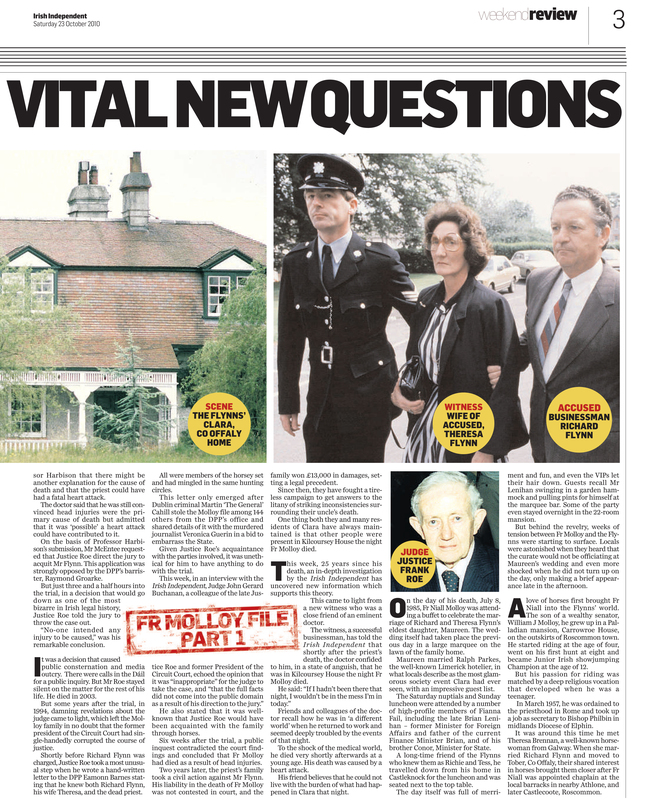 It has also been reported that the Fianna Fail politician who was at the wedding of the daughter of Richard and Theresa Flynn was Brian Lenihan Sr who was the deputy leader of Fianna Fail at the time. 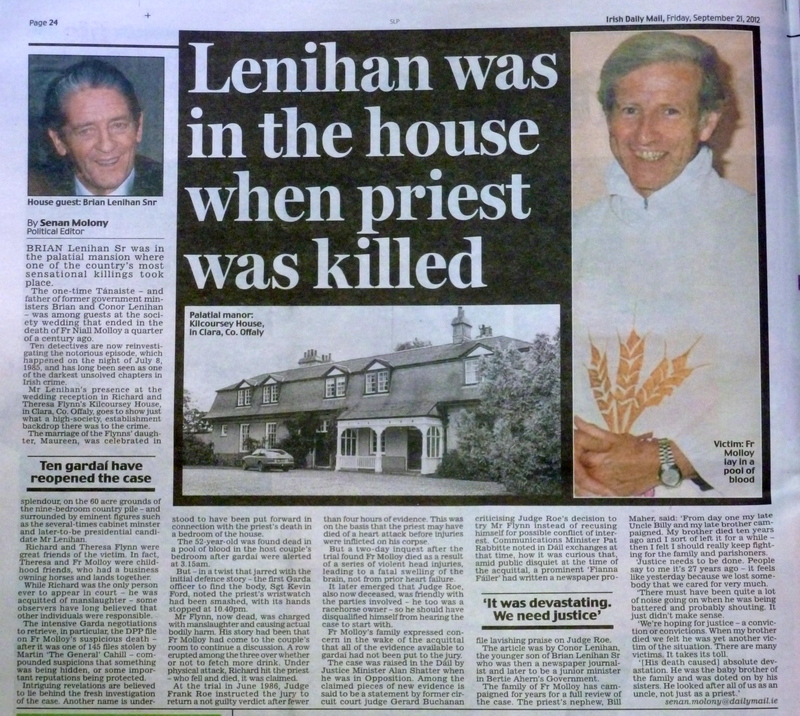 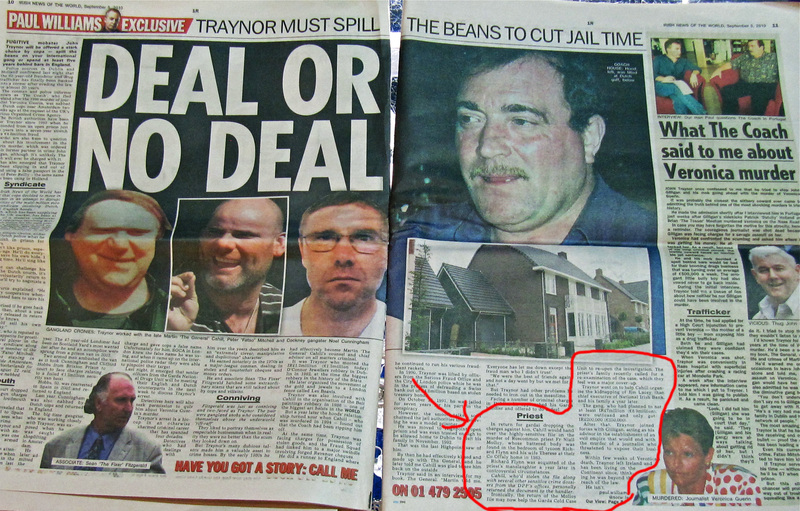 ‘Brian Lenihan was a good friend of Theresa Flynn’ said Mr Maher. 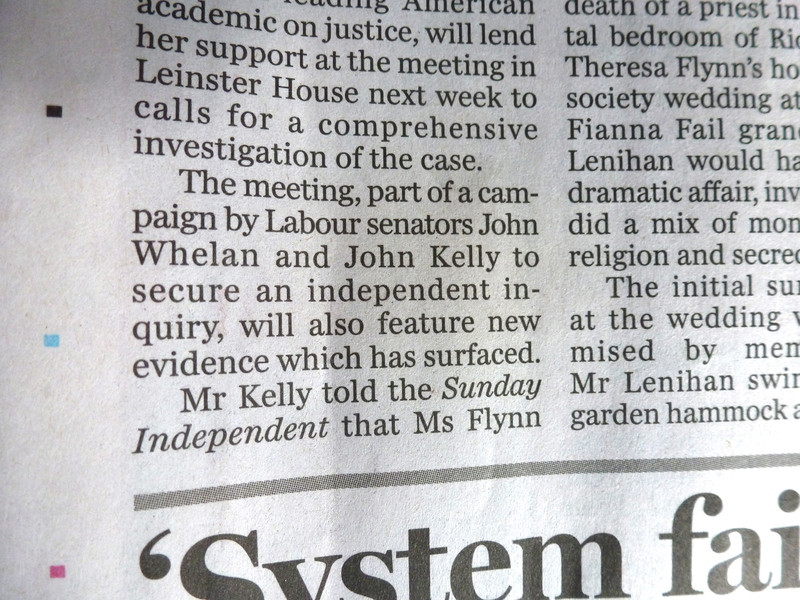 It is understood another Fianna Fail politician was present at the after party. 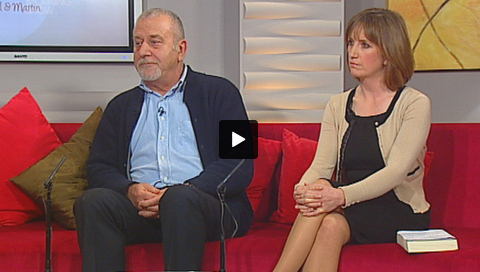 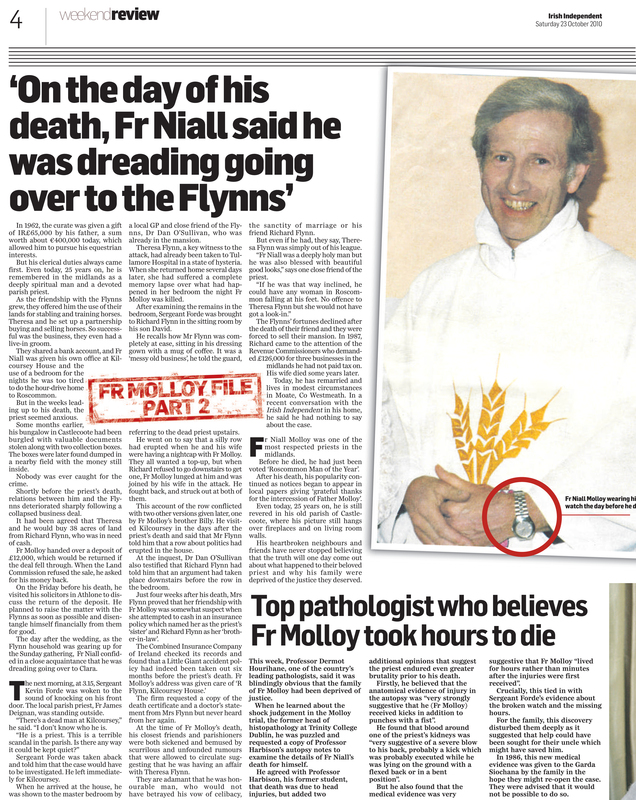 Fr Niall Molloy was murdered following the wedding of Maureen Flynn to Ralph Parkes. 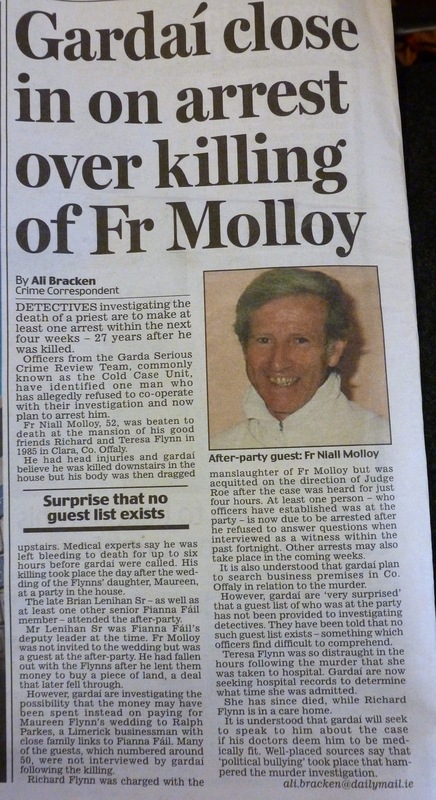 He had been invited to the after party and was beaten to death. 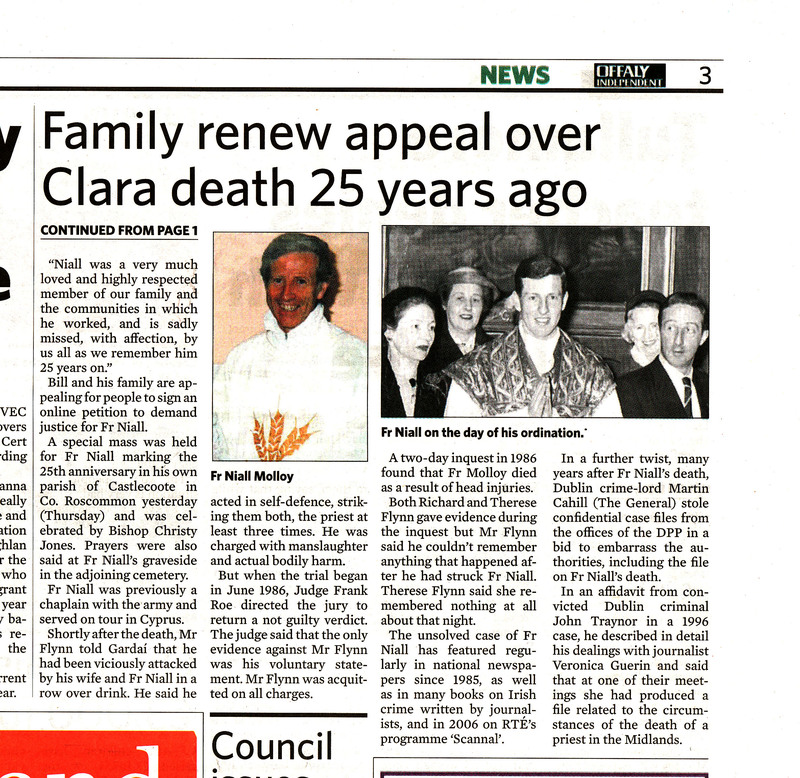 He was left bleeding for six hours before help was sought. 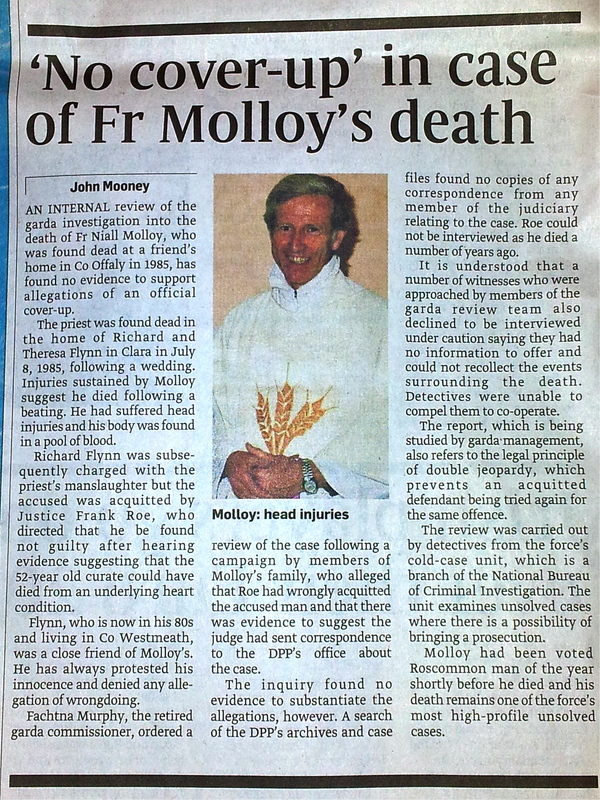 Richard Flynn was charged with the manslaughter of Fr Molloy but was acquitted after just four hours by Judge Frank Roe. 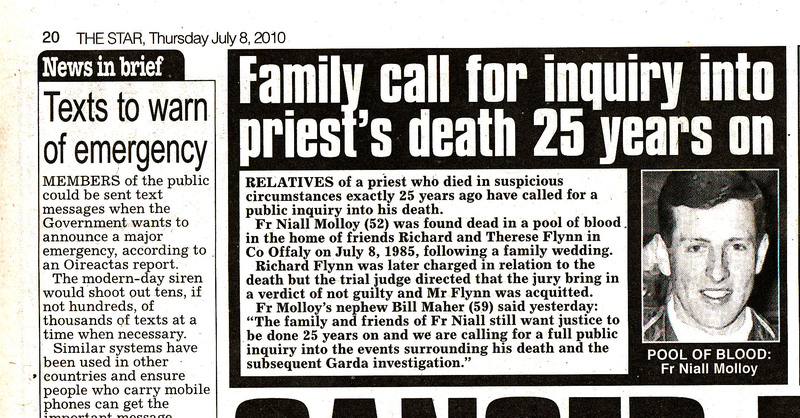 It later emerged that he was a close friend of Mr Flynn and should never have been allowed to preside over the case. 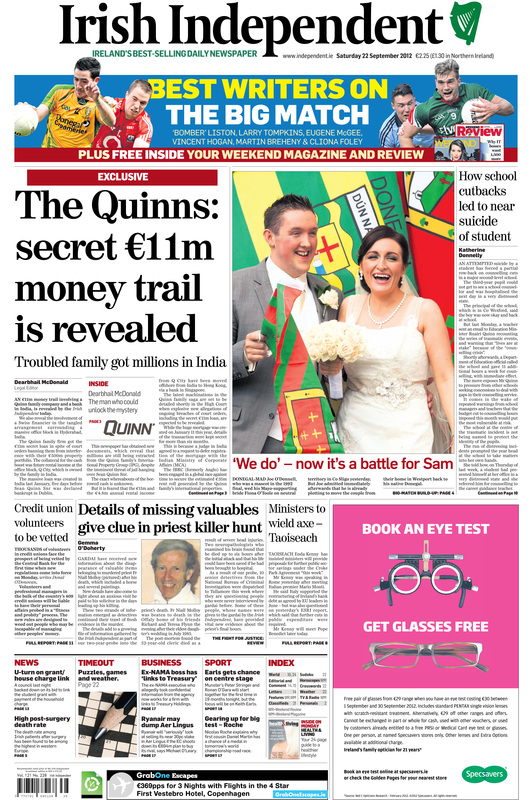 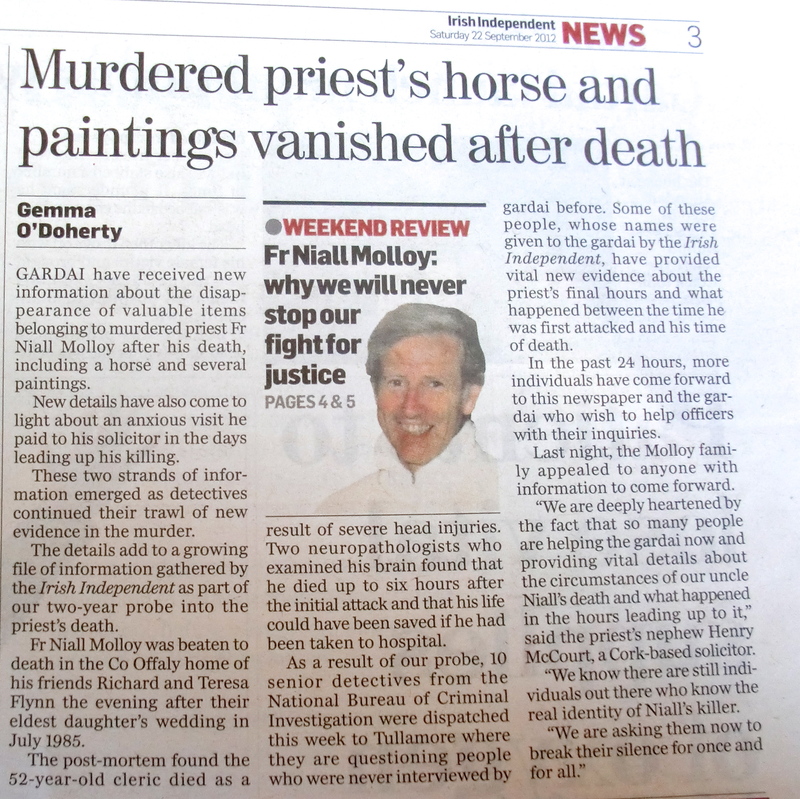 More controversy arose when it was discovered that vital witnesses had never been interviewed by gardai. 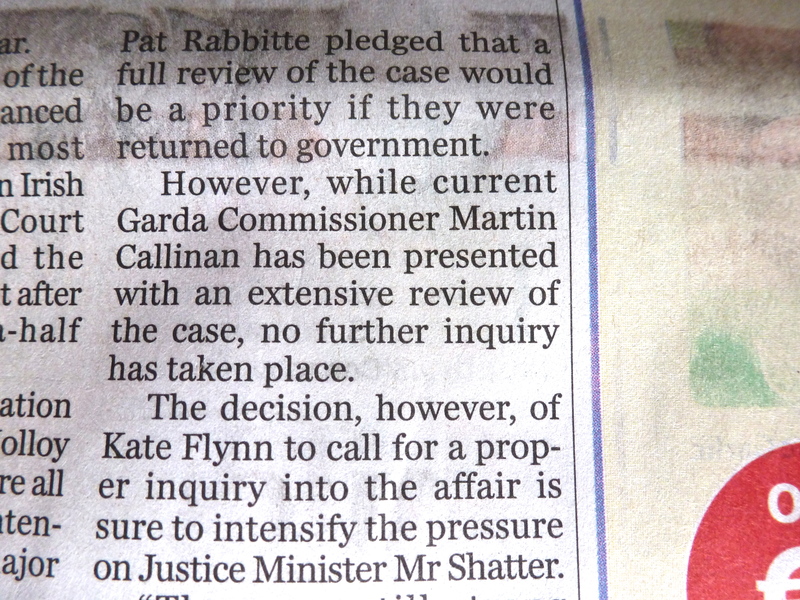 Justice Minister Alan Shatter called for a fresh inquiry when in opposition along with Minister for Communications Pat Rabbitte.